HOUSTON, TEXAS — “This isn’t punk at all,” Goretooth said from behind the bar at White Swan Live, as he listened to Beto O’Rourke’s old punk band’s song “Rise,” off their EP The El Paso Pussycats. “It’s the Cranberries with punk vocals, sanitized with a napkin.” Then I played him another song by Foss, O’Rourke’s short-lived punk band from the early 1990s, called “Al Sobrante, Snowzone In His Pants, Got The Chutzpah Rolling.” “This song here is punk,” he proclaimed, giving it a solid two thumbs up. It was the Saturday before election day, and I was drinking a Tecate at the dive bar in Houston’s Second Ward neighborhood; a slew of local punk bands were slated to go on stage. 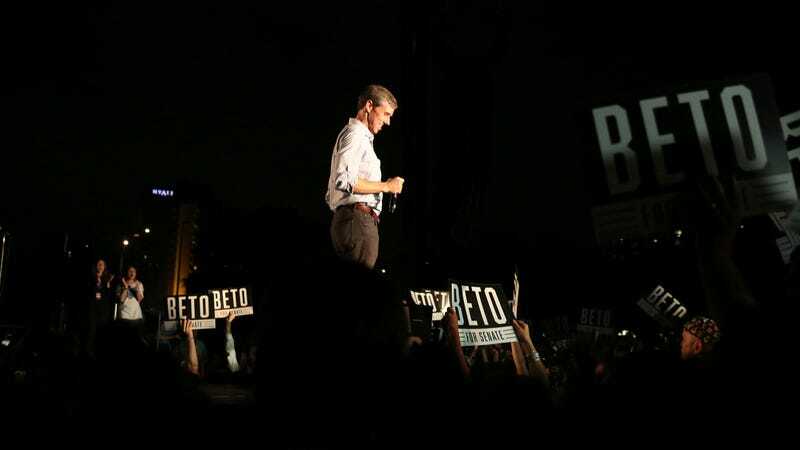 I was there to get some answers to questions that, if not exactly critical to the outcome of the election, had been nagging me ever since O’Rourke’s time as a punk had become a talking point in his race against Ted Cruz: Just how punk is Beto O’Rourke? Isn’t running for office the least punk thing a former punk could do? Was Beto... a poseur? I asked Goretooth (whose government name is John Kingston, “but everyone knows me as Gore,” he told me) if he planned on voting this year. He gave me an emphatic no—he has never voted, nor is he registered to vote. We were hanging out around the bar with Miguel Soto, a regular whose heavy metal band Diamondback Mad had performed at White Swan Live earlier in the month. “I live so low in life that no matter who’s elected to do what, none of it’s gonna trickle down to me,” Goretooth said. “A lot of people feel that,” Soto said sympathetically. I turned my attention to Soto. “We don’t usually get people like you in here!” he said, possibly referring to my trench coat and Nike sneakers. When I pointed out that he wasn’t who I expected to meet either—Soto is middle-aged, and was dressed more like an accountant out for the weekend in dad jeans and a button-up—he laughed. Another vote for O’Rourke’s music—punk! But what did he think of his politics? Soto described the Senate candidate as a “typical liberal.” Unlike Goretooth, Soto was a regular voter. He had voted for Ralph Nader in 2000, calling it his “protest vote.” “I didn’t like Al Gore at all,” he said, adding that he was especially opposed to Gore’s wife Tipper for her crusade to get “parental advisory” warnings for music she deemed sexually explicit and violent. The show hadn’t started yet, so I wandered outside to the large outdoor patio in the back, where I found Derek Huddleston and Greg Brown smoking cigarettes and drinking a couple of beers. Brown’s band Broke Off was set to perform later in the evening. Huddleston and Brown, both stalwarts in Houston’s punk scene, play together in another band called Ballistics. Is O’Rourke punk? I asked them. Huddleston chimed in. “I like his hustle. I like that he’s been out, not taking money from PACs, that he’s not corporate funded, or at least right off the cuff he’s not going to sell things away,” he said. His refusal to take PAC money—isn’t that the most punk thing about O’Rourke? I asked. “I thought it was the skateboarding at Whataburger thing,” Brown said. “And he’s doing all of that without the PAC money,” Brown noted. “The fact he’s livestreaming all of it, and he’s behind the wheel, is really cool,” Huddleston said. “There’s nothing tough about Cruz,” Brown said. O’Rourke the politician, totally punk. But what did they think of Foss? By now, Brown’s bandmate Bobby Flores, a fresh-faced 25-year-old, had joined us. I played the three of them the two tracks from the band’s EP. “I don’t know how anyone could say that’s not punk rock,” Flores said. At one point while listening, he had whispered, Nice. Brown demurred. “I’m gonna cap off my opinion as, I’d vote for his politics more than I’d vote for his band,” he said. Back inside, the first band Ese took the stage. More people had straggled in, the crowd one expects to see at a punk show—skater kids and your more classic punks with studded leather and neon hair.